Hey there and welcome to week two of Project: #1room30days. I am excited to have this project underway and even more excited to show you my progress for week one. This past weekend, I spent time de-cluttering this room and getting rid of the things that no longer fit in the new look that I am going for. A lot of things I sold online through my local Facebook group and some items I donated. I also got a chance to install and decorate my Ikea Vittsjo Shelving unit. The unit comes with two rows and retails for $79.99. In this space, I wanted an area to hide all of my little items that would normally be in drawers, a place to store my abundance of makeup, and I wanted it all to look pretty and less cluttered. 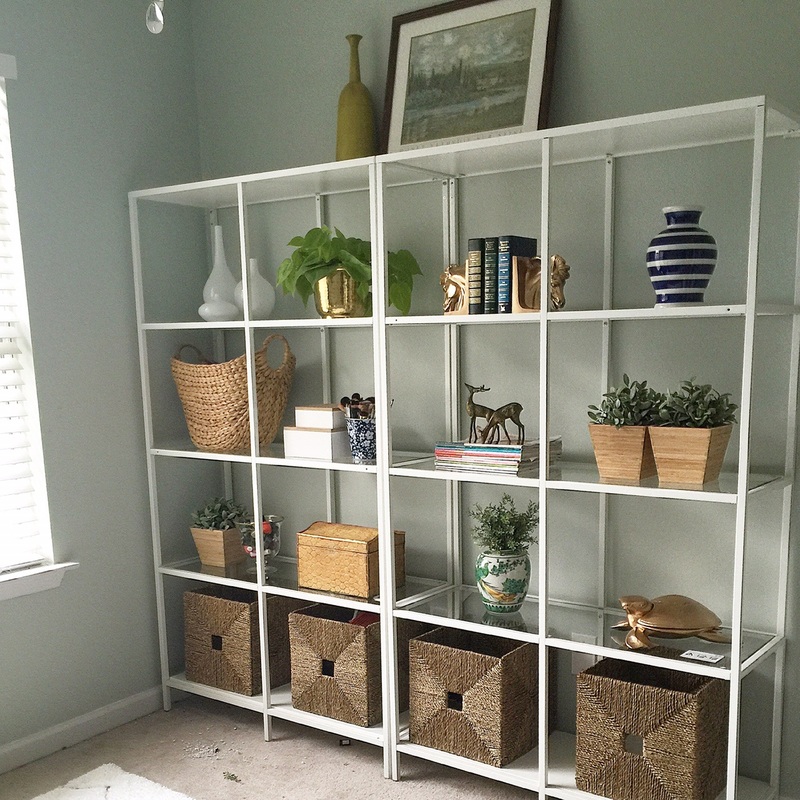 Since I have always loved the look of the Ikea Vittsjo shelving that I had seen on Pinterest and it is now offered in white, this unit was definitely up my alley. You may remember in my office plans, I mentioned wanting to purchase the Ikea white Expedit unit. Well, once I saw it in the store, I changed my mind. It wasn’t as tall as I had hoped it would be. I am much happier with the Vittsjo for sure! I placed my shelving unit against the wall where the futon used to be. It actually came with anchors to secure it into the wall to avoid tipping. I purchased two units and pulled different pieces that I already owned, some from Goodwill, and other little store bought trinkets and decked out my units a bit. 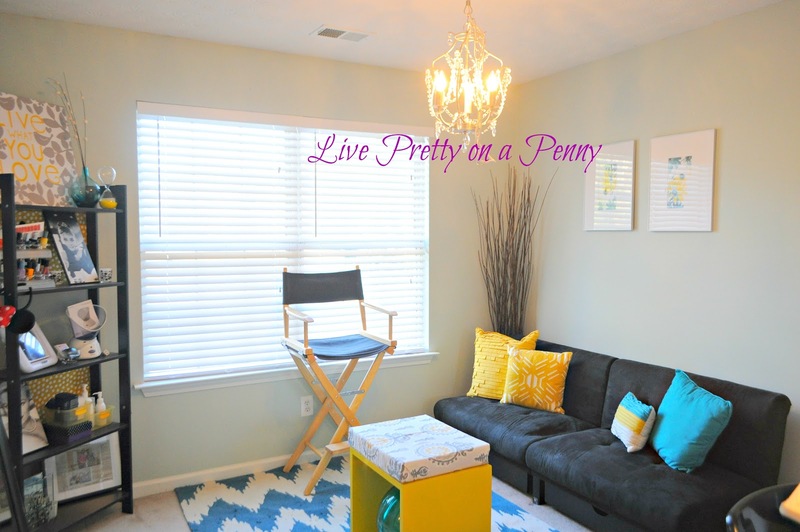 I want the new office to serve as a space for myself and my husband to use, so I didn’t want to make it too girly. Since he is giving up the basement as his man cave so that we can use it as a family space, I thought the least I could do it make this a unisex area. Stay tuned next week for more office updates! I have been sourcing rugs and definitely think that I have found a winner! Oh, and don’t forget to follow me on Instagram to check out other sneak peeks. Your new shelving looks fantastic and I love all the open storage it provides! Looking forward to seeing your rug! Just gorgeous! Love the shelves so much, looks like you are off to a perfect start! Thanks Carli. I am starting to get stuck, but I am liking how its coming along. Wow Erin! What a difference already, I love it! Love the shelving. The neutral elements, baskets, plants are my favorite touches. Thank you Tiffany. Those are some of my favorite touches as well. 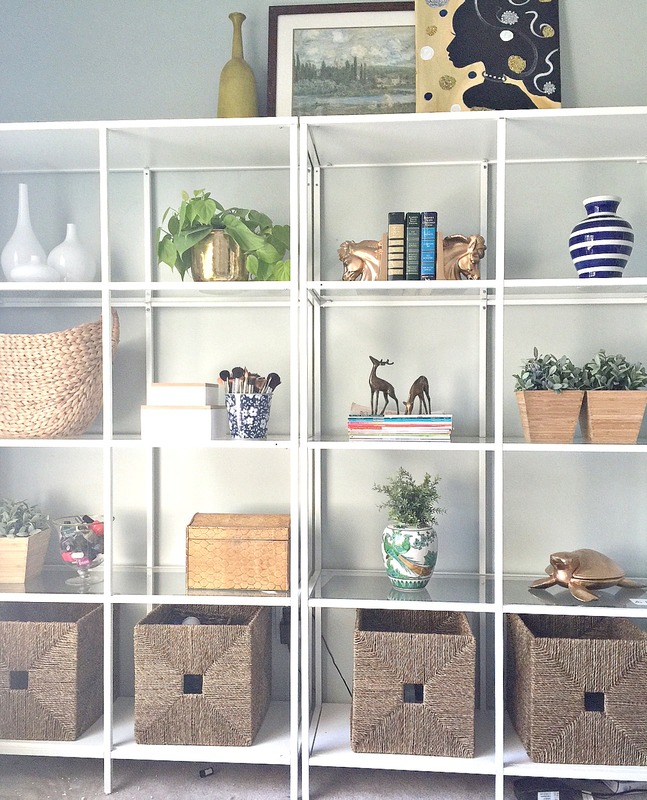 I really love the way you styled your shelves Erin! I think the baskets on the bottom row add a nice touch. Thank you Lisa. The baskets were much needed so I am glad they look how I had envisioned. Great visuals on the shelving units.. I know the final makeover is going to be awesome .. Can't wait ! (I love the painting on top). Do you the think these shelves would hold a lot of books? I currently have the Expedit unit and running out of room for books.